Recipient of the prestigious Brownlie Scholarship Melissa Derby (Ngāti Ranginui) hopes that her research makes a difference in the lives of the children participating in her study. She also hopes they will find enjoyment in reading just like she did as a child. A student at the College of Education, Health and Human Development | Te RāngaAko me te Hauora, Melissa’s whānau inspired in her a lifelong passion for reading which, in turn, means this project holds a special place in her heart. Working with bilingual children – specifically te reo Māori and English – Melissa has co-constructed a literacy programme designed to support phonological awareness (the ability to hear and decode sounds in words) and vocabulary knowledge. Both skills are widely recognised as being key predictors of children’s later success in reading and writing. With one in three children unable to meet National Standards for Year One reading and one in four unable to meet National Standards for Year One writing, Melissa hopes to give early recognition for those who may fall behind in order to give them the best possible start. “Once children fall behind, it can be difficult to recover their skills, and this may have implications for their experiences and outcomes during their formal schooling and beyond,” she says. Melissa has given her thesis, which is part of the A Better Start National Science Challenge, the working title of Ko te kai a te rangatira he kōrero: Restoring Māori literacy narratives to create contemporary stories of success. Her supervisors are Gail Gillon and Angus Macfarlane, who she calls “the biggest draw card to UC” having long-admired his work in Māori communities and schools. 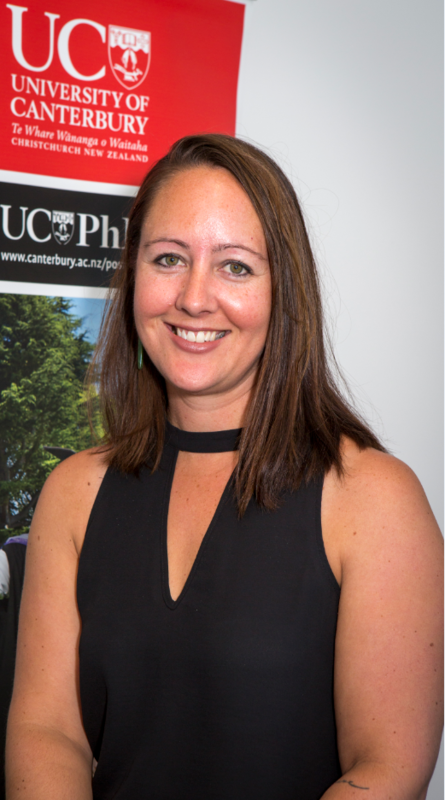 Prior to her work at UC, Melissa obtained a Bachelor of Arts in Education and Māori Resource Management from Victoria University of Wellington, a Master of Arts in Māori Development (First Class Honours, Dean’s List for Exceptional Theses) from AUT University and she holds a Graduate Certificate in Indigenous Studies from Columbia University, New York.